Ntop is a network traffic monitor that shows the network usage. It display a list of hosts that are currently using the network and reports information concerning the (IP and non-IP) traffic generated and received by each host. It is similar to what the popular top Unix command does. 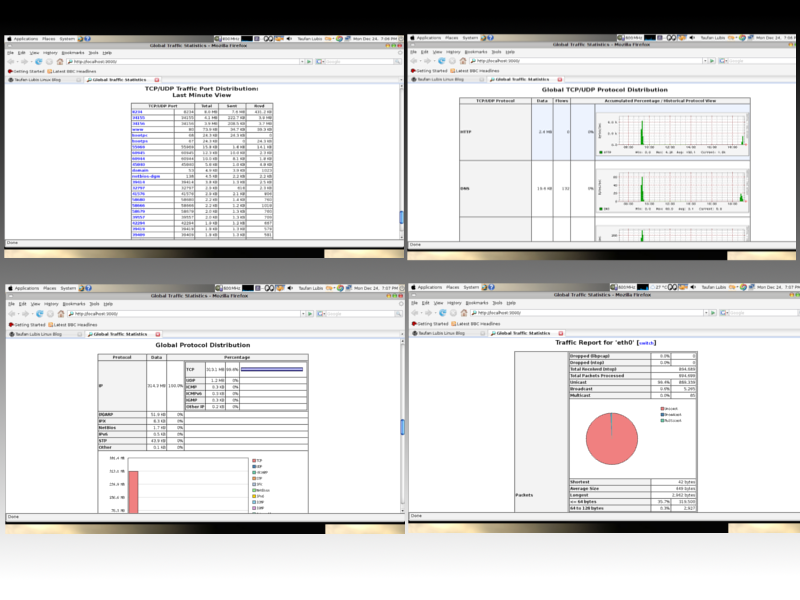 Ntop may operate as a front-end collector (sFlow and / or netFlow plugins) or as a stand alone collector/display program. 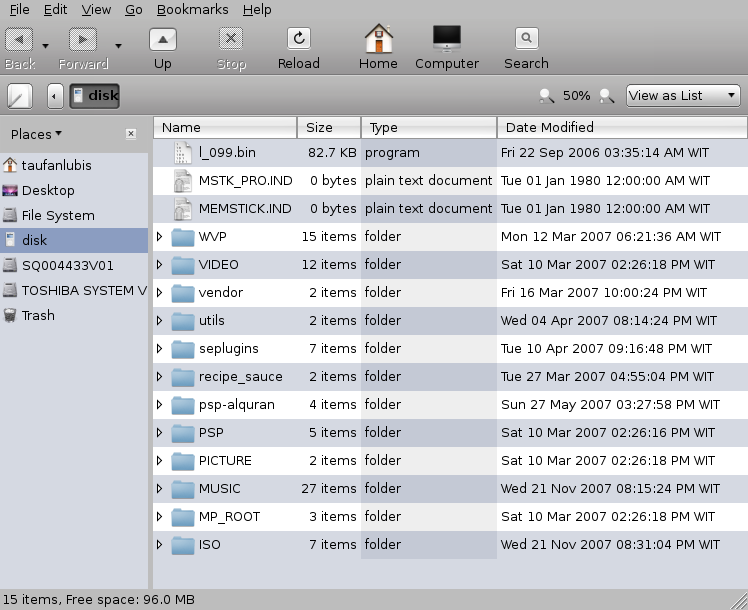 A web browser is needed to access the information captured by the ntop program. The ntop users can navigate through ntop (that acts as a web server) traffic information and get a dump of the network status. It looks like an agent with an embedded web interface. Ntop needs a limited configuration and administration via the web interface, reduced CPU and memory usage. It’s easy to use and suitable for monitoring various kind of networks. It has been developed by Luca Deri, and Italian research scientist and network manager at University of Pisa. Need to get 3161kB of archives. After unpacking 12.4MB of additional disk space will be used. Selecting previously deselected package libgd2-noxpm. Selecting previously deselected package libpcap0.7. Selecting previously deselected package ntop. Warning: The home dir you specified already exists. The home directory `/var/lib/ntop’ already exists. Not copying from `/etc/skel’. adduser: Warning: that home directory does not belong to the user you are currently creating. To run ntop at your web browser, type ‘localhost:3000’ at your url. Tcptrack is a sniffer program which can be used to monitor the tcp connection on the network. It passively watches for connection on the network interface. It’s similar to ‘top’ command. Need to get 39.6kB of archives. After unpacking 139kB of additional disk space will be used. Selecting previously deselected package tcptrack. The most basic way to run tcptrack. Only show connection from IP address 10.66.29.121. You can see the source (client) and destination (server) addresses and ports, connection state, idle time, and band witch usage. 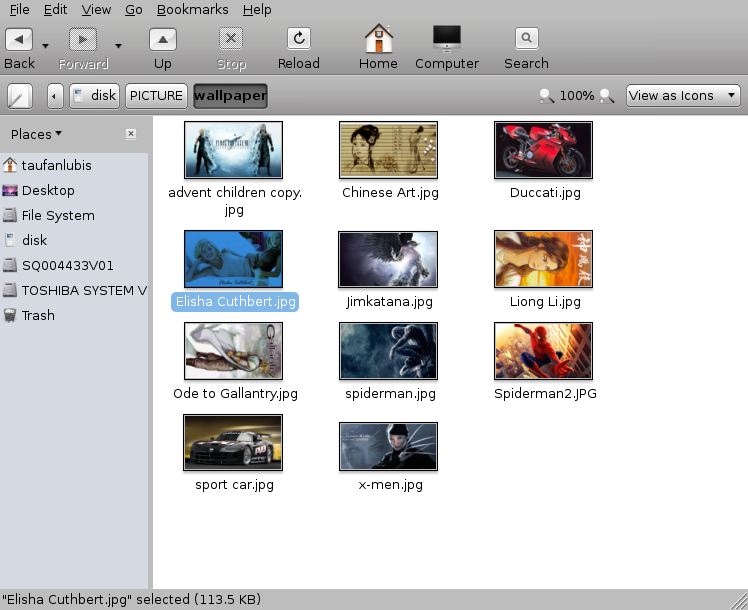 It is a graphical front end for nmap security scanner. Because the limited help available from the nmapfe help menu, better you read from nmap manual page first. NmapFE was originally written by Zach Smith (key@aye.net). It’s now maintained by Fyodor (fyodor@insecure.org). The newest version of nmap can be obtained from www.insecure.org/nmap/. 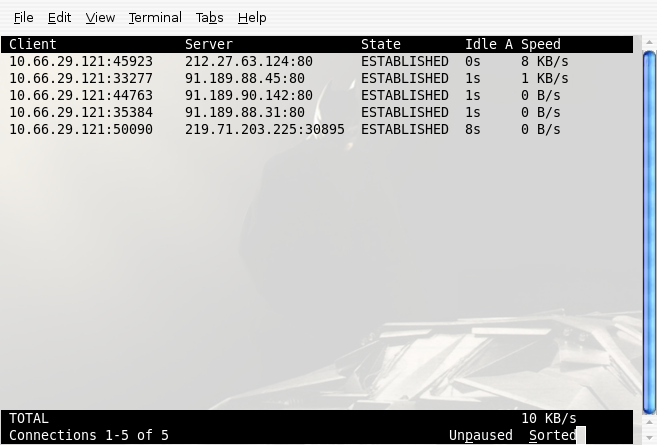 If you are not get used to with nmap options, it will be a good alternative. Need to get 108kB of archives. After unpacking 246kB of additional disk space will be used. Selecting previously deselected package nmapfe. 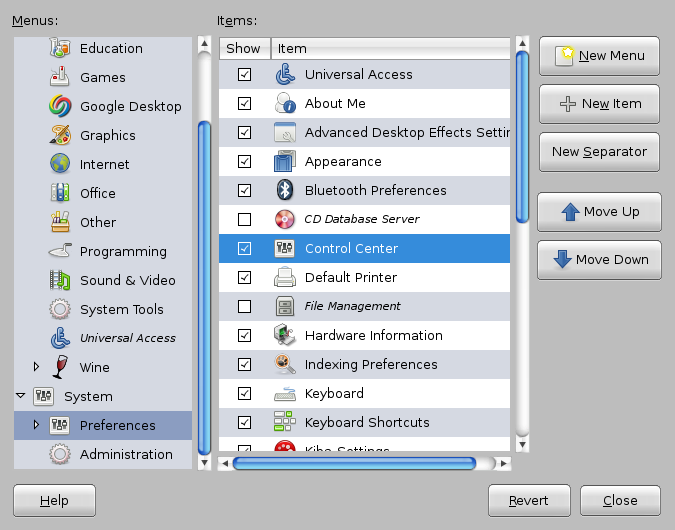 Gnome control center is a front end to configuration applets (capplets) that lets you configure your GNOME desktop. 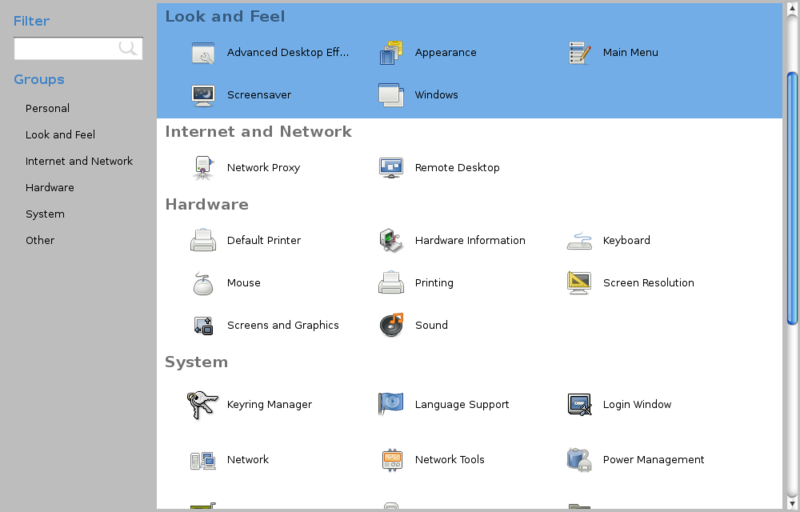 It’s the same like YAST in openSUSE or Control Panel in Windows. 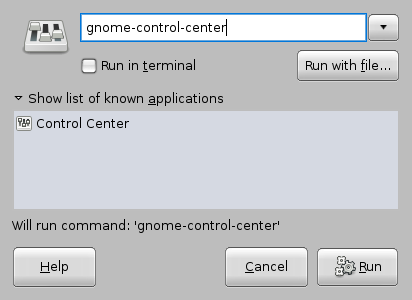 To open gnome-control-center from ‘Run Application screen’, press Alt+F2 and type ‘gnome-control-center‘. To enable it, Open System > Preferences > Main Menu. From the Menus List, choose ‘Preferences’ and mark ‘Control center’ on the ‘Items List’. The other way to open “Main Menu”. Press Alt+F2 and type “alacarte”. I think PSP is one of great game devices have ever made. You can play games, hear music, see video, see photo, take photo (additional device) even browsing the internet with its wifi capabilities. When you plug the PSP to your Ubuntu with USB cable, it will act like a flash disk. So, you can upload or download any data that you like. First, connect the PSP to your Ubuntu with USB cable. From PSP, Go to ‘settings‘ and choose ‘USB Connection‘. 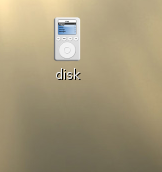 Wait, for few seconds then you will get a new disk icon on your desktop. The icon will be different based on your themes. I use Mac Leopard themes, so I got an icon like below. 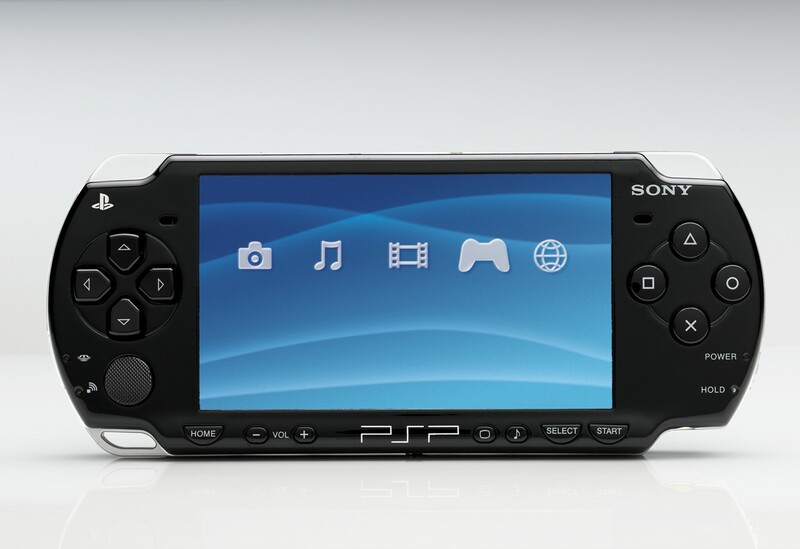 Now, you can double-click the icon to go to PSP directory. SAVEDATA	– for your saved games. You can save your ‘saved games’ . 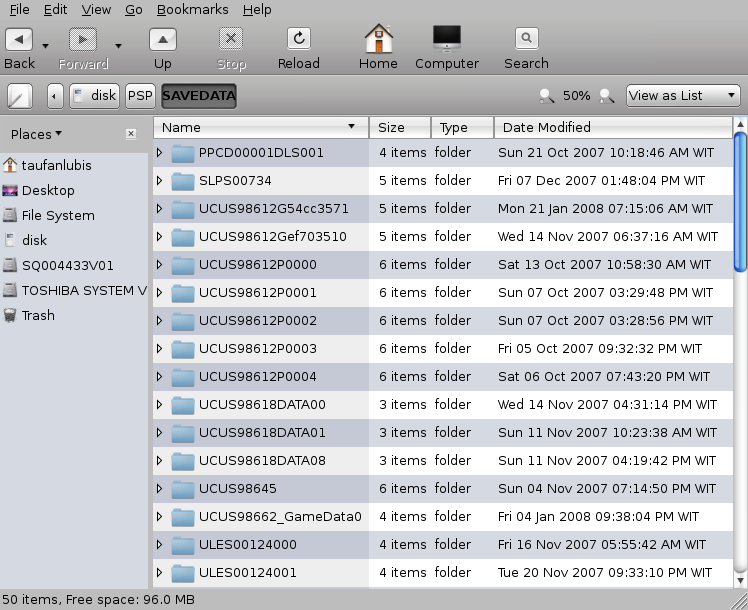 For example, when you play Tekken (my favorite) until few levels then you remove the game from the PSP, your ‘game levels’ is still kept in the ‘SAVEDATA’ directory. So, next time you install the Tekken again, you still can play with your old ‘game levels’. The concept is the same like PS1, PS2 or PS3. You can change any discs but your level is saved in your memory card. I think it’s cool idea. So, you can install or remove any games….. Sample of the ISO directory in my PSP. Sample of the saved games in my PSP. Sample of the music directory in my PSP. Sample of the wallpapper directory in my PSP. One thing I still can’t find until now is, set my Linux machine acts as server and my PSP as a client. Cool right? I can do that in Windows. 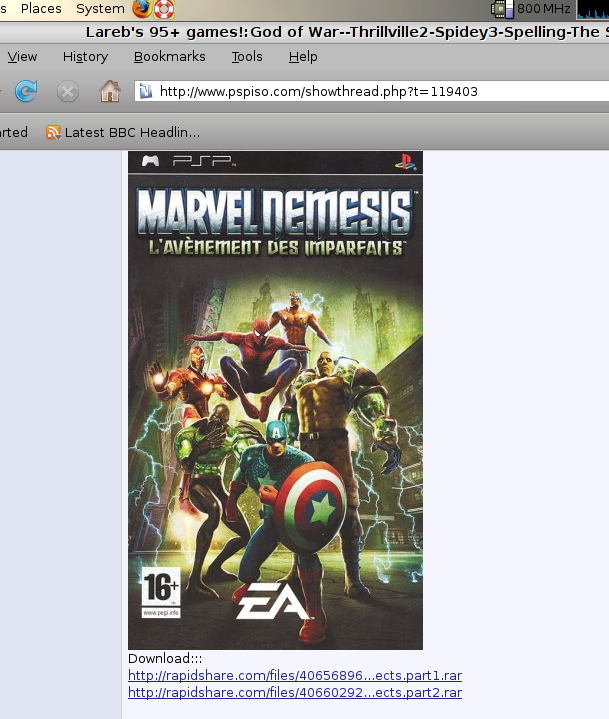 So, I don’t have to upload or remove big game files to my PSP. For your information, PSP games size are from 70MB to 1.5GB meanwhile my Sony Stick Duo memory card is only 2GB. There are so many web sites provide games for PSP but I think www.pspiso.com is best. 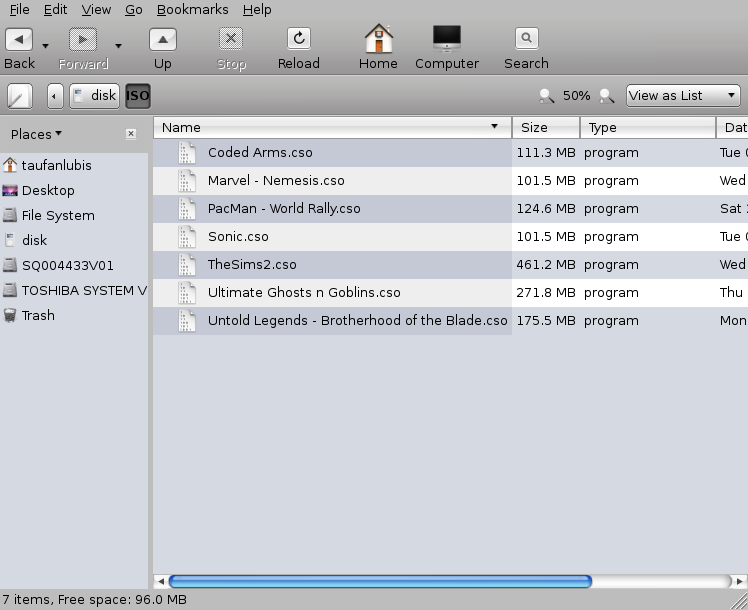 Usually games with big file size are divided into few links. If you want it easier, just choose a game with one link only (1 file = 1 game, not split), so you don’t have to merge it again. 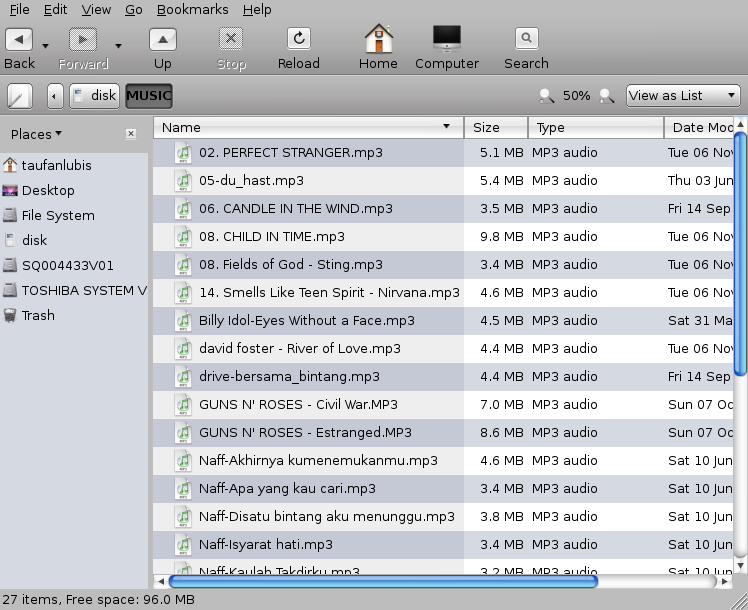 When I turn my laptop this afternoon, I suddenly lost my sound and got this ugly red cross beside my speaker. When I double click the icon, I got this message. Then I open System > Preferences > Sound ……I lost my sound device. I can’t run ‘alsamixer’ from the terminal, then I did log off and reboot the system …..
nothing to make the sound work. It’s normal daily routine that I do every day and I always use the ‘main server’ for my repository, so I’m very sure that it didn’t cause the problem. When I googled, I found a solution in here. This blog belongs to Kamil. He mentioned that it could probably a a Gnome bug and is most likely distribution independent. I agree that it may caused by independent distribution. When you install something using Sypnatic Package Manager, any programs that have been tested by Ubuntu Team and compatible with it has a Ubuntu logo beside the package title. Because, there’s so many applications that I’ve run in my laptop. But, who cares….. If you wanna try a new thing then you have to be ready with consequences. The point is how we can fix the problem. So, here it is. Problem 1. I don’t have any more access to my audio. If you see the list in my /dev/snd directory, the access is only for root. Then I gave a new access to me (taufanlubis). for temporary access. But, I got a new error message. Then I try to make it permanent. The user `taufanlubis’ is already a member of `audio’. Strange, now I’m part of the groups but I still can’t hear the sound. I though it’s caused by Gstreamer plugins. So, I did update my system again …. …. and restart my laptop again. Problem 2. I lost my sound device. But, still there is no sound. Then, I just realized that I don’t have my /dev/dsp, /dev/mixer, /dev/snd/pcm* anymore. That’s why, I can’t run alsamixer from my terminal. So, re-install my sound driver. Now, I got my device back. Problem 3. I lost my access to System > Administration > Users and Groups. I don’t know how but I don’t have any access to ‘Users and Groups’ which is bad because I can’t set the permission to my user login (taufanlubis). The only way is I have to run it as ‘root‘. So, I opened my terminal, Application > Accessories > Terminal, login as root and open ‘users-admin’ application. Then, I updated my ‘User Privileges’ and reboot the system. I have my sound back. I have my sound icon back to normal. Test with xmms, …..done….. I can hear the sound again. 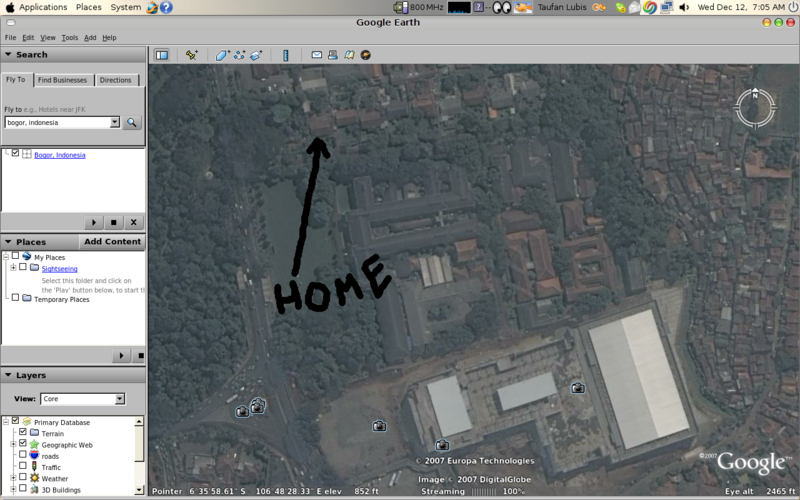 Google Earth is a great program to see a place from satellite. It’s designed for Windows before but it’s also available for Linux. You can download the program from www.google.com. It’s in linux installer format, so you don’t have to compile it again. After you downloaded the program, go to its directory and run the installer. 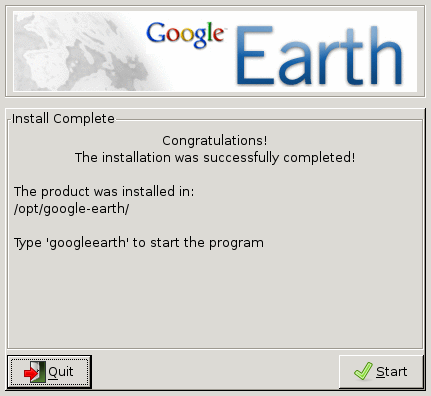 Uncompressing Google Earth for GNU/Linux 4.2.198.2451……………………………………………………..
Then, click ‘Begin Install’ button. You will get the screen above after the installation process is done. 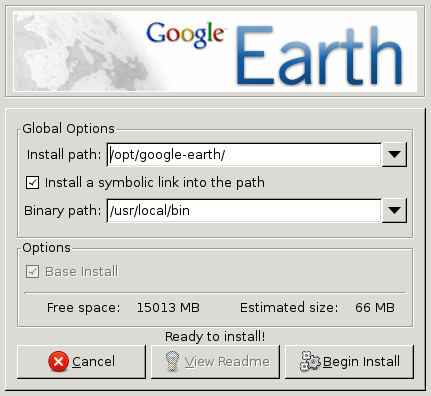 You can run it from Applications > Internet > Google Earth. Type your destination at ‘Fly to’ text box. For example, I stay in Bogor, Indonesia. So, I just type ‘bogor, indonesia’ in ‘Fly to text box’. But, make sure that you connected to the internet otherwise the google earth will not work.